Hey guys! So excited to share these plans today! This is about as simple as they come! We think just about every room can use a good bench. 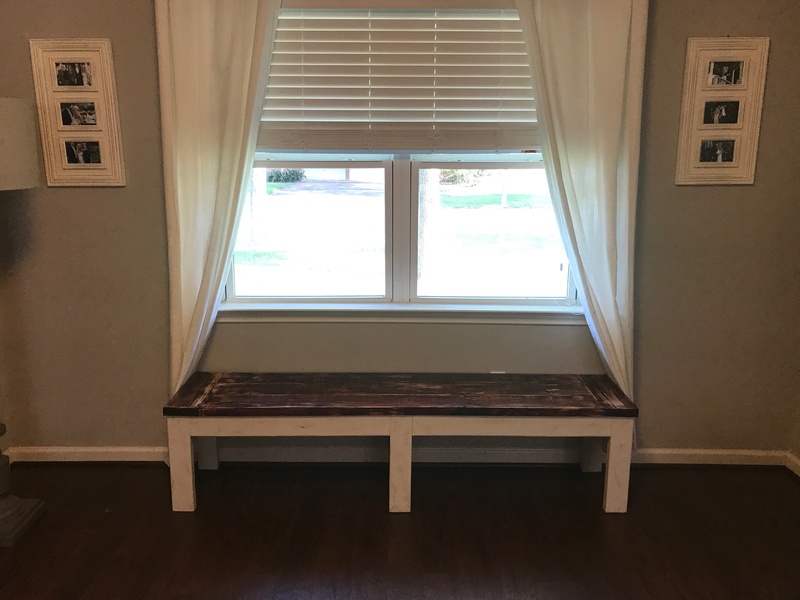 Ash and I designed this DIY Farmhouse Bench for under $25 for our little sister’s home, and check out how it turned out! Before we get started, make sure to check out our YouTube video tutorial on building this bench HERE or by clicking below! You can download our FREE plans to build your own bench HERE! We started by making our cuts! 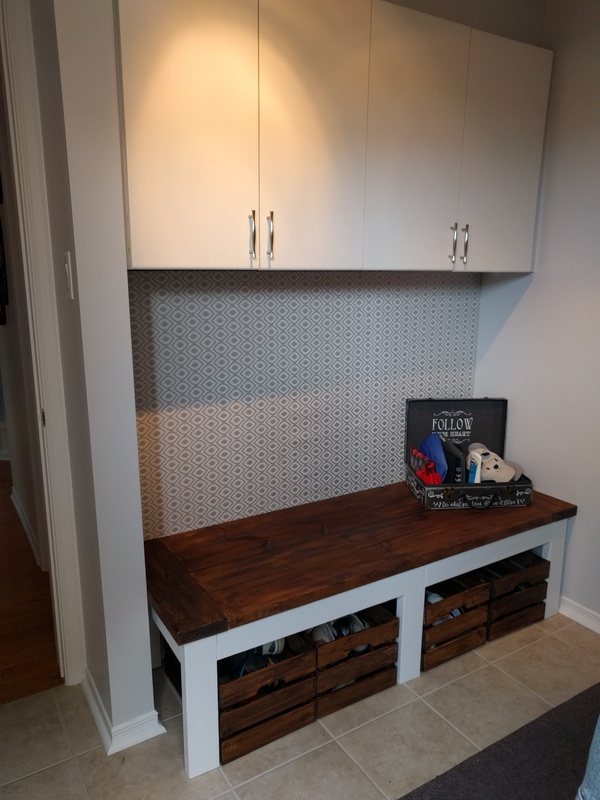 For this bench we used our Ridgid 12″ sliding compound miter saw, but any miter saw will get the job done! Once your cuts are made, it’s time for pocket holes. We used a Kreg Jig K5 for this step! Kind of, sort of, totally love this tool. You can find it on Amazon HERE! We use ours on just about every project. You will line your bench top planks up first. You can see on the photo where we placed the 1.5″ pocket holes. We attached all of the boards with 2.5″ pocket hole screws through those pocket holes and into the adjoining boards. Next, we added the breadboards. These are the small pieces on each end of the top. They give a more polished finish on each end. We also attached these with 2.5″ pocket holes. Now to build the base! We are building two of these and then we will attach them together with small runners. We used our Kreg Jig to make 1.5″ pocket holes on each of our long runners. There will be two on each of the ends, and we also placed them running down each one. We will use those holes to attach the base to the top in a later step. We attached each runner to a leg piece using wood glue and 2.5″ pocket hole screws. After building two of these, we attached them using small runners. The plans call for you to attach all the small runners with 2.5″ pocket hole screws into the legs, but if you can’t fit your driver in the narrow space, you can also attach the small runners to the front leg assembly first using pocket hole screws, and then attach the back leg assembly to the runners using 2.5″ spax screws through the back leg assembly and into the runners like the photo below. Finally, we are attaching the base to the top. 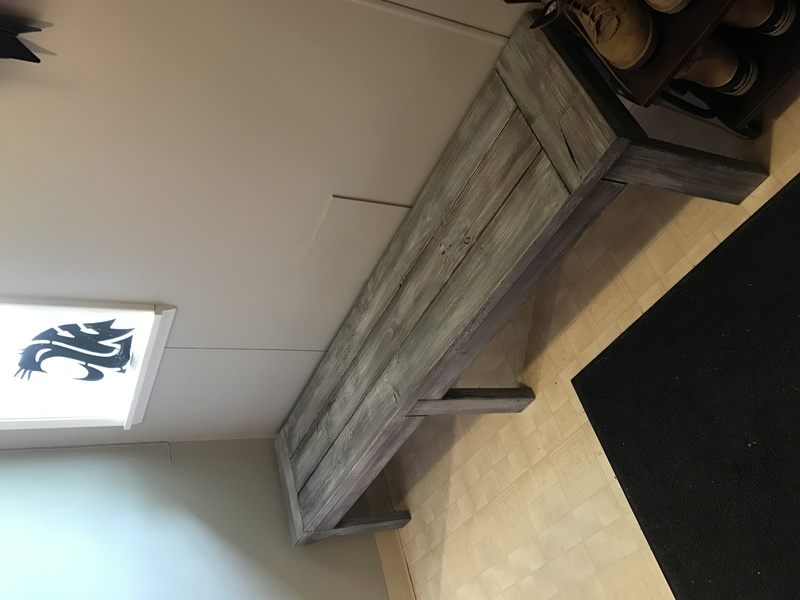 We did this by laying the base upside down on the bottom of our bench top, and attaching with wood glue and 2.5″ pocket hole screws through the pocket holes on the aprons and into the bench top. Flip it right side up, give it a coat of paint or stain and you’re done! Hope you love it as much as we do (and our sister does)! 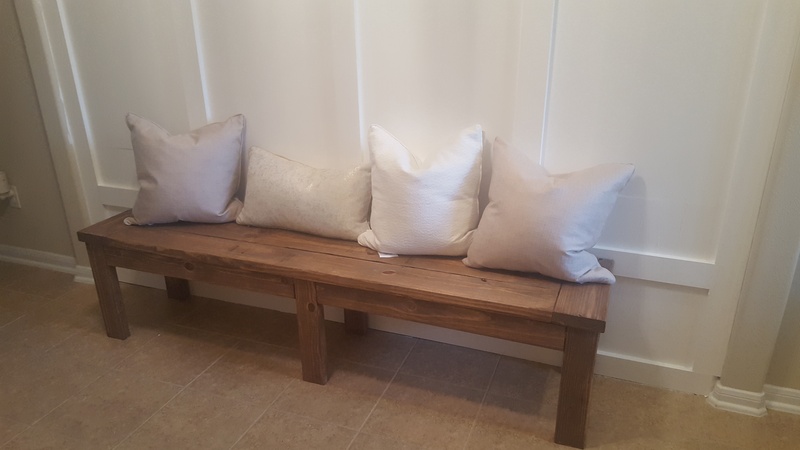 This is a super simple, $25 bench that would be so cute in any room! Make sure to send us pics or tag us on social if you build one! And, don’t forget to check out the video again HERE and SUBSCRIBE! We have a new video coming each week and we don’t want y’all to miss out! Can I use nails or regular nails instead of pocket hole screws? I love watching all your videos! I’ve pretty much have watched them all as I feeding my baby her bottle! 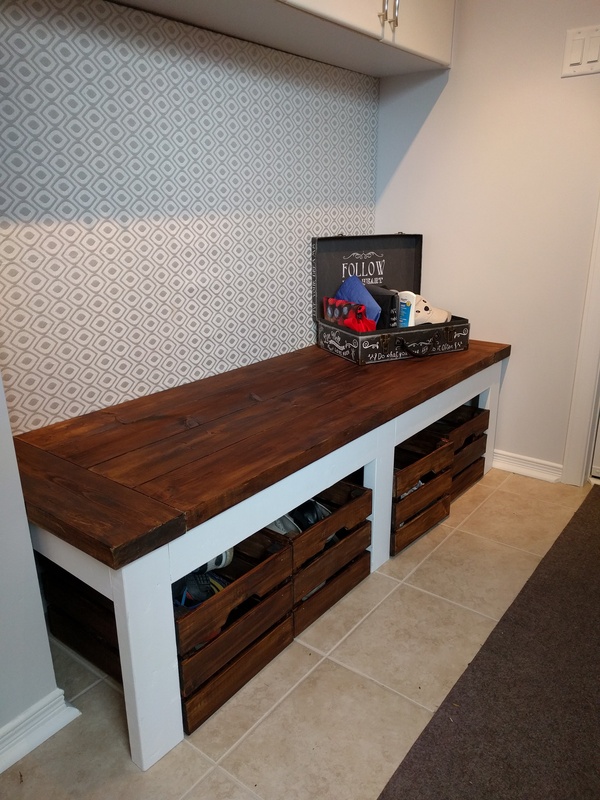 I finally finished this mudroom bench and it looks awesome! I added farmhouse style X’s in the middle amd shelves on the bottom to make it my own but am so glad to have the shanty2chic plans available! So glad I found shanty2chic and got my kreg jig now. I will be building lots more to come so plz keep the videos coming!! Could you tell me where these hooks are from? Love this bench!! Had to scale mine down some for the space I wanted to put it in but it turned out beautiful!!! I’m onto the barn door console next! Love you two! Wish I could add the picture! Where are the hooks from? Hey! Loved the plans! So easy to follow for a beginner! Love the color of stain, what color and brand did you use ? Anyone know where these baskets are from?? Could you please tell us what color you used for the paint/stain? I love it but can’t seem to find anything similar. Thank you! It’s Seine by Valspar! Very easy to build! Fits perfectly under our entry way window. Stained the top and made it rustic by sanding the stain. I painted the legs with chalk paint and sanded them in certain spots to give it the same rustic look as the top. I used a sealer for the stain and legs. My dogs love to sit on it and look out the window! Than https://uploads.disquscdn.com/images/a2183ffc314cd62f87aa50000060af2436dec0123bfeff4fbbcc5423d8446f30.jpg https://uploads.disquscdn.com/images/27b2b9ca2ff98141c3efc9d1d4a7f5afd72041b4d88ac01ffaa6602a2700caa1.jpg ks for the great easy to follow plans!! This was my first build with my Kreg jig. I can’t wait to build more things! I used two wood stains, Varathane Briarsmoke and Rust-Oleum Dark Walnut. I put them on in random stripes following the wood grain. Blending a little as I go. After that dries I put on a cream latex paint and water wash. Then I use a coarse brush to very lightly put on a cream colored latex paint to make it look like wood grain. Finish with a poly top coat. Can you tell me a little more about how you did this? With the stains in random stripes, did you cover the entire bench in those stripes? Did you apply the cream latex paint twice? You applied it, then water washed it? How do you water wash? And then did you reapply the paint lightly again as you described? Sorry for all the questions! This is the exact look I want to achieve! So pretty! I used Minwax water based stain in Coffee. No top coat needed once stain dries it doesn’t come off. Just make sure it’s dry before you sit on it. I made this the morning of the Superbowl 2017 before our party and people sat on it all night. Water based stain only takes an hour to dry other stains take longer make sure to read the label to see how long it will take to fully dry. Hope this helps, happy building! What stain/paint did you use for your bench? I love the color! Check your plans, should the wood be 2″ x 4″ x 8′ (the plans show 8″). Is this stained or painted?? 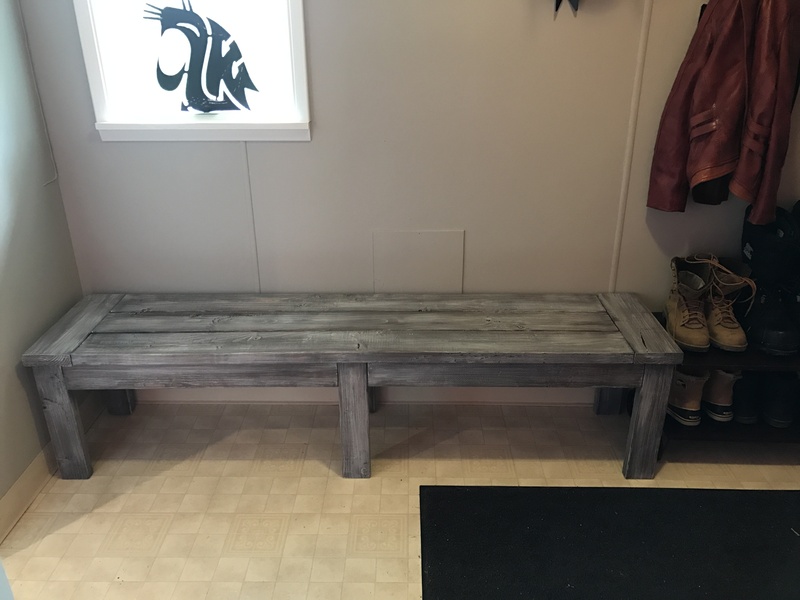 Bought the wood and making this bench over the weekend. Hopefully I’ll get it finished and be able to share pictures. I’m painting it turquoise with valspar flat and your DIY plaster of Paris recipe then antiquing with dark wax. Can’t wait! 1 – 2x3x8 come into play at?? I am not sure if it was in the plans and they edited it, but I do NOT see a 2x3x8 anywhere in the plans I downloaded. Try downloading the plans again. Did you guys cut the rounded edges off your 2xs? sure looks that way. i was wondering the same thing. Maybe that is where the 2×3 comes into play that they refrenced? We did! But this isn’t a necessary step! What color paint/stain did you use on the bench?